Today’s letter in the Really Like This Book podcast scripts catch-up is P, and today’s author is Barbara Pym, a quiet and wickedly funny English comic novelist of the 1950s and the 1970s. She had a curious career, being published quite successfully during the 1950s, and then being dropped, rather brutally, after her sixth novel, by her publisher Jonathan Cape in 1963. They thought that fashions had changed, and that in the radical, politicised and terribly modern 1960s, no-one would want to buy her restrained, delicate and extremely low-key novels. She dwindled into literary obscurity for thirteen years. She was rediscovered in a very public fashion in 1977, when Philip Larkin, one of Britain’s most respected and celebrated poets, and Lord David Cecil, a leading Oxford don, both named Barbara Pym in a newspaper survey article as one of most neglected living English novelists. The very next day a journalist was on her doorstep, at the house she shared with her sister in her retirement, and soon publishers began to ask her, rather embarrassed, if she had any spare manuscripts they could look at. 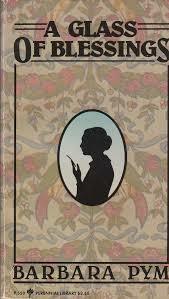 Her first novels were rapidly reissued, and she published two more novels before she died in 1980, aged 67. Eight more were published after her death. 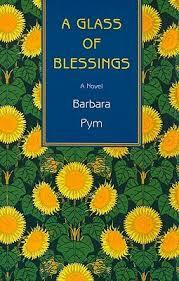 Although publishers rejected her, Barbara Pym just kept on writing. The absolutely hideous cover of the copy I first read. I’m astonished that I made it past the vile collage. Like most Pym fans I have all of her novels, and cannot decide which one I prefer. I came to Pym about six years ago, when a colleague at a conference talked about her books. I bought one of her novels at random from a charity bookshop, and was completely hooked. That first Pym experience, A Glass of Blessings, remains a great favourite, probably because my reactions to it were suffused with the shock and pleasure of a marvellous new discovery. It’s is not one of the usual Pym suspects, because Pym is normally recommended by her first novel, Excellent Women, or by Some Tame Gazelle. The title of A Glass of Blessings is an unusual mouthful, unfamiliar unless you know the 17th-century poetry of George Herbert. The heroine, Wilmet Forsyth (a name from a novel by Charlotte M Yonge, another obscure literary reference), leads a leisurely and elegant life of lunches and coffees and regular church attendance, much as Jane Austen’s Emma did. But Wilmet does not organise the parish. She is far too languid, and is too easily cowed to stand up to the formidable forces that support a parish church. She simply does nothing, supported by her civil servant husband Rodney, living in the house of her agreeable and independent widowed mother-in-law Sybil, cooked and cleaned for by Sybil’s maid. Her lifestyle of leisured indolence is remarkable to read now, deeply interesting as a lifestyle most of us will never know. Wilmet’s placid disinterest in being busy for the sake of being busy, makes her a very restful first-person narrator. Her amused detachment is delightful, but it also makes her a victim of her own thoughts, since she is so often alone, or solitary. She suffers from an inability to notice things: she fails to spot the signs of impending marriages, she totally fails to spot a gay man: she is pretty much oblivious to the finer details of relationships until they’re presented to her. She even misses completely her husband’s failed attempt to have an affair. a cover to make me yawn …. After her rediscovery, a small industry of Pym-fanciers sprang up in American and British universities. ‘Lunch as an indication of character in the novels of Barbara Pym’ would be a good research thesis subject, if it’s not already been taken. Barbara Pym took a lot of pleasure in the minor details of daily life, especially lunch: when to have it, where to go, what to eat, the conversations of the people sitting next to you, and whether you would go there again. Pym’s style is to secretly laugh at all her characters. It’s rare to laugh out loud while reading her novels, but it does happen, because she is wicked. Her humour comes from comic juxtapositions, and the inappropriate thought or comment from an innocent abroad. Most of her male characters are jaw-droppingly pompous, and she does not spare us their capacity to be boring, arrogant, tiresome and plain stupid. The narrative voice in Pym novels is always female, usually put-upon by the tiresomeness of men or dominant bossy women. a cover design of zzzz …. A Glass of Blessings has a theme of homes, and where people are to live. The new priest needs a place to live. When Mary Beamish’s mother dies she has to find a new home, and tries out a convent before becoming the housekeeper of a retreat home, and then marries the new parish priest: her life is all about finding a home to care for. Wilmet spends most of her crush on Piers Longridge wondering where he lives and who looks after him during his regular hangovers. When she leaves a phone message with his mysterious room-mate she is rather taken aback by the not-quite-us sound of his voice. When she meets this room-mate or flat-sharer when she is taken home by Piers for tea, she is even more taken aback to meet a small but neatly turned out boy from Leicester called Keith, who cooks very nicely, does occasional modelling for knitwear patterns, and works in a coffeehouse off Oxford Street. For those of us who still have our mothers’ 1950s and 1960s knitting patterns, the very idea of using one of their male models as a character in a novel is simply domestic writing genius: familiar, unthreatening, subversive, alarming. The coffeehouse (not a coffee-shop, that’s a much more recent term) has got to be the Kardomah, a famous chain of 1950s cafés that I remember from my 1970s youth in northern Scotland, with its ugly, dated orange and brown décor. Keith knows Mr Bason too, but they are not quite at the same social level as Wilmet and her husband, or as Father Thames and Father Ransome. Father Bode, on the other hand, is low, like his tea, which he drinks stewed with lots of sugar. Socially higher characters have one-upmanship discussions about Lapsang Souchong or plain Earl Grey. Keith doesn’t know French, which is a cause for amusement between Wilmet and her Kensington mother-in-law. Times have certainly changed, since speaking French in London now would simply be showing off, or being dubiously foreign. how can a book cover be so dull? 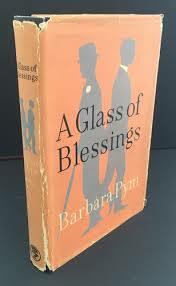 A Glass of Blessings is particularly blessed with a small cast of gay male characters, which are a rarity in this kind of novel, from this period, and written in such a gentle and affectionate tone. Mr Bason is waspish and petulant, is bitchy about everyone, and causes offence in St Luke’s because he wore Mr Coleman’s tailored cassock during a service instead of his own. Mr Coleman took his cassock home after that and began bringing it to church in its own little suitcase, to avoid further borrowings. Let’s pause for a moment to enjoy the blissful characterisation of a lay server in an Anglo-Catholic church who is so devoted to his role, and so invested in his position in church hierarchy (middling low), that he buys his own tailored, made-to-measure cassock. As an expression of egotistical pompousness and priestly play-acting this is just glorious. The malicious Mr Bason, who undoubtedly did not borrow the cassock of glory by accident, could have become a malevolent bad fairy in this novel, since he has just lost his job at the Ministry where Wilmet’s husband works. Fortunately, Wilmet directs Mr Bason’s unaccountable love of cooking to the vacancy for a new housekeeper at the clergy house of St Luke’s, and Mr Bason is saved. Or is he? He begins to indulge his passion for beautiful objects again, borrowing Father Thames’s Fabergé egg for a few days, carrying it around on his errands in a canvas shopping bag. In the end, he leaves the clergy house to run an antiques shop in Devon that serves teas in the season. Heaven for him. Barbara Pym is fascinated by rules. Wilmet is always wondering about whether she can do this or that, or what people will think: her life seems to be constructed of rules that ought not to be broken. There are endless rules governing the peculiarities of the very high and celibate anglo-Catholic clergy in her Kensington parish, which provoke genteel tussles for dominance about which candle should be removed at which point in the service. These have nothing to do with religion, and everything to do with power and one’s place in the church’s local hierarchy. Rules about women and men in close proximity are more familiar: on the very day of Mrs Beamish’s death, poor Father Ransome, the youngish and rather handsome priest who is lodging with her, has to move out of the house hurriedly because otherwise he’ll be living there alone with Miss Mary Beamish. 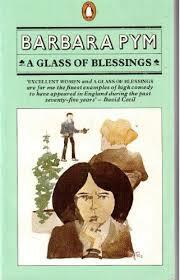 A Glass of Blessings is a happy book. It’s a delight to read, because Wilmet is so nice, and so silly at the same time. She had lots of fun in the war, when she served in Italy as a Wren (as did Barbara Pym herself), but in peacetime, married to a boring husband, she finds her fun in having hopeful crushes. She has close friends, which is a relief: a heroine in a novel who does not have any close friends would be disconcerting. Her little dramas of unrequited affection, her obliviousness to the extraordinary campness in her church’s daily life, the London offices that she visits and peers into, and the heavenly lunchtime conversations, are so ordinary, and so lovingly described, that the book is like prosecco: mildly fizzy, warming and butterly and comfortably delicious. One of your nice blogs as usual. Barbara Pym was translated in French in the 1980s and bought by my mother who wanted to compare them to he originals in English. Therefore, later, I was lucky to have the two sets. 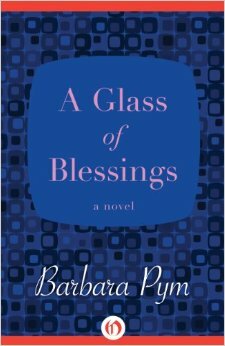 I have always thought (but I may be wrong) that “A Glass of Blessings” and “Excellent Women” are the peak of Barbara Pym’s fiction writing. They are less fizzy than “Crampton Hodnet” and “SomeTame Gazelle” or even “Jane and Prudence”, the further ones are slightly slack though the anthropologists and their academic communities are fine, and the last ones, “Quartet in Autumn”, “The Sweet Dove Died” are gloomy and sad, and “A few Greenleaves” quite reaistic and picturing a new emerging society. I follow the papers delivered at the different annual conferences in the US and in the UK by th Barbara Pym twin societies and admire how much a book and “une oeuvre” can be squashed as a lemon to find he smallest drop of juice! However there are many recurrring themes treated differently. I was particularly atttracted to the Anglo-Catholic Church one that made me look round at my own RC Church. Differencs of course as the orgabisation is different, but the Vatican II Concile as done a lot to make us close and it is funny how the petty claims and crises are the same. Class, of course, is not the same. We have diferent subteties and hierarchies. But BP was a good door to use to enter into the arcanes of the British society of the time. She returns in other books to the theme of gay men.But didn’t she suffer of unrequited love from one of them? I have already been too long butone last point: even loosely joined, her noves create a world where characters recur – fleetingly. We have then a sense of completeness. You have given more food for an adept, you see, but you really show a whole new word for people who doe not know Barbara Pym! 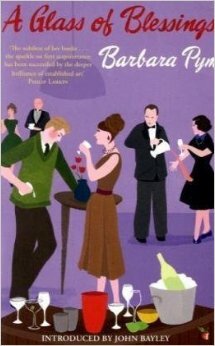 Thank you – I can never read too much about Barbara Pym! Do you know ‘Barbara in the Bodleian: Revelations from the Pym Achives’ by Yvonne Cocking? I met this wonderful scholar of Pym’s writing when I was lucky enough to jointly win a Barbara Pym centenary prize and invited to the 2013 BP Society conference. It’s a fascinating collection of the papers she delivered at the society’s conferences in Oxford and in Cambridge, Massachusetts, plus two extra chapters. Such riches! Yes, I got the Bodleian book, it’s quite interesting.